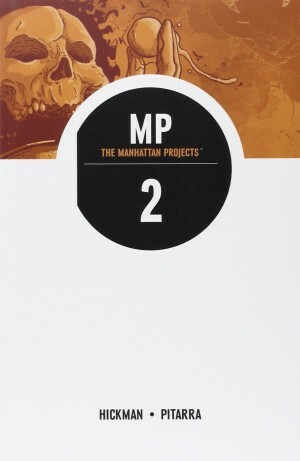 This is based on an alternate reality diverging towards the end of World War II. In the War Department in 1942, General Groves, the cigar-smoking leader of a project employing science to bring about the end of the war, is interviewing Dr Oppenheimer. But not that Dr Oppenheimer. No, this one is Dr Joseph Oppenheimer, Robert’s twin brother born six minutes later and possessor of multiple personalities. All of these personalities are distinctly, well, peculiar is the kindest word that could be used. Eating animals to consume their souls, he then progresses to killing people and storing them in a freezer. He is captured and imprisoned but escapes and kills the saintly Robert. Subsequently he masquerades as Robert and is taken on by Groves to help develop weapons to end the war but also to support Groves’ wartime which never ends. 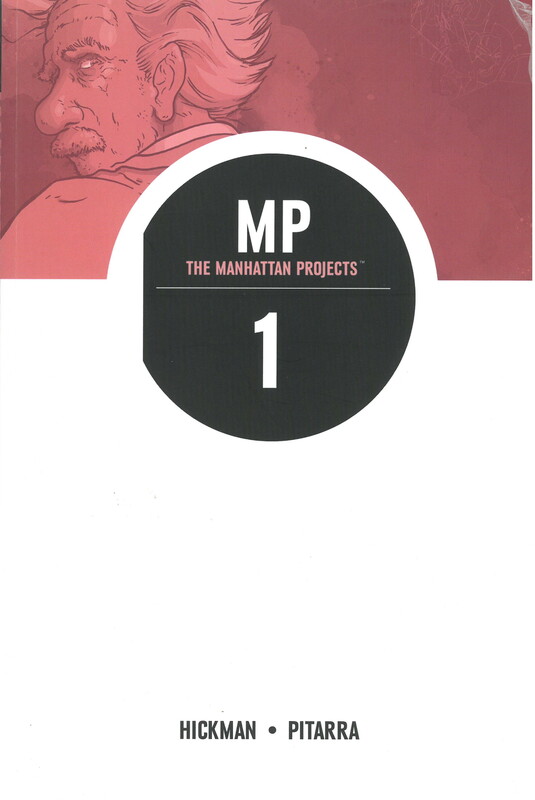 Manhattan Projects seamlessly integrates historical figures from the period in a story that originates in a world you think you know, but spirals off to ever further reaches of the imagination. 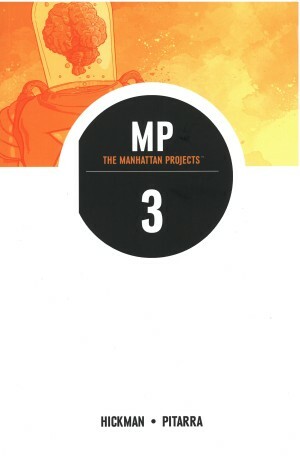 Twisted versions of Alfred Einstein, Richard Feynman, and Enrico Fermi feature heavily, and in an echo of Dr Manhattan in Watchmen, Dr Daghlian survives the radiation that killed him in real-life to become the “Atomic Messiah”. US President Roosevelt’s death just before the end of the war allows the scientists to rescue his brain waves to become the first AI. These characters are employed with such insouciance that it’s easy to assume that Robert Oppenheimer did in fact have an evil-twin brother. Or that Werner von Braun did betray the Nazis to join the Manhattan Project, and further, did have a high-tech prosthetic arm. It’s a neat little detail as von Braun suffered a serious break to his left arm before surrendering to US troops as a way out of post-war Germany before assisting NASA with its rocket programme. Employing a ghoulish humour, the story tells a nightmarish scenario where scientists pursue knowledge and ways of killing, which after annihilating an alien species brings them into contact with a godlike creature who is very displeased with them. However, it is hard to be too concerned by an entity that looks like a cross between The Hulk and Beetlejuice and wears some natty blue trunks to presumably preserve the deity’s modesty. 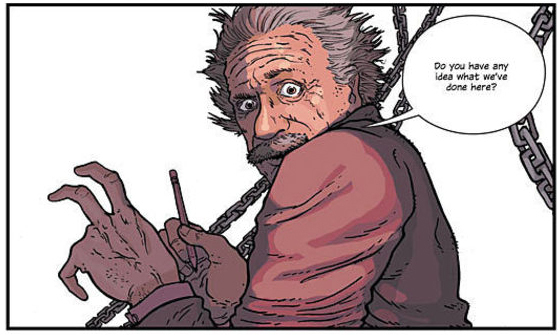 Nick Pitarra’s art superbly conveys all the horror and the humour of the story and the colour scheme applies a unique look which perfectly captures the tone. 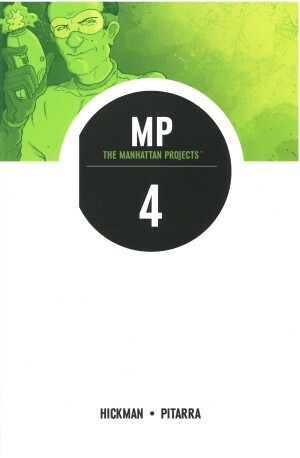 Manhattan Projects is a disquieting, yet captivating and highly recommended read.